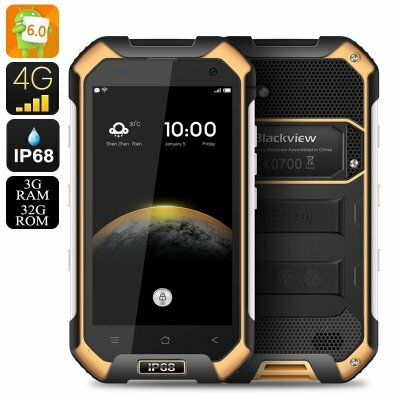 Successfully Added HK Warehouse Blackview BV6000 Android 7.0 Smartphone - IP68, 2Ghz Octa Core CPU, 3GB RAM, NFC, OTG, Atmospheric Sensor (Orange) to your Shopping Cart. The mighty specifications on this Blackview BV600 are truly great as it sports a powerful octa core CPU clocked at 2GHz and a whopping 3GB of RAM. With the Mali GPU and plenty of onboard storage it can keep your entire media library to hand and easily cope with the heaviest of use for gaming and videos without dropping frames or stuttering. Whether you're going climbing, running, biking, or to the swimming pool the Blackview BV6000 has the right protection to join you. Its IP68 protection means it can be submerged in water or dirt and won't suffer any ill effects. With Gorilla glass 3 protection and a tough metal frame this rugged phone was built to withstand almost anything so can take the knocks and jolts you may experience cycling or running and is well protected against extreme outdoor conditions. The 4.7 inch HD capacitive screen it the perfect size to view all your media and games while allowing the phone to remain small and compact enough so as not to weight you down and at under 250 grams its lighter than most phones of this caliber. This rugged Smartphone benefits from good GPS accuracy and with its atmospheric pressure sensor can even help you predict changes in the weather, perfect for keeping you dry and on track when in the great outdoors. Supporting two SIM cards and with 4G connectivity you can tap into the worlds fastest cellular networks so you can follow your sport teams success even if your miles away from a TV. Two IMEI numbers allows both SIM card slots to be utilized at once, great for manage work and personal contacts as well as avoiding roaming charges and ensuring superb coverage so your never mall than a call away. Empowering you with NFC the BV6000 allows for quick easy wireless data transfers and can support you E-wallet through Android Pay, no need to take the any cash or cards with you again as this phone lets you pay for everything from filling up the car to find dinning out. Running Android 7.0 Marshmallow the BV6000 has the latest OS from Google, offering improved performance. Doze mode and Google Now on Tap will see your battery life extended and improve internet searches streamlining your interactions with its intuitive inputs. This tough Android 7.0 Smartphone comes with a 12 months warranty, brought to you by the leader in electronic devices as well as wholesale rugged phones..